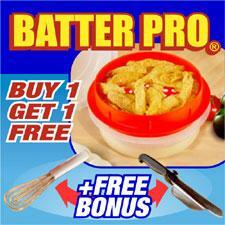 A gift that every single red blooded American man, woman and child can not live with out: The Batter Pro. Forget all the hype of healthy foods, and carbs, and lo-calorie sodas. The Batter Prois the gift that keeps on giving! What a marvelous gift for that college kid in your life that is too much of a nerd to go to the school cafeteria and would rather make gourmet meals in the comfort of his dorm room! All that glistening glory of french fried potatoes (maybe with a little mustard), fried spam and country fried steak, onion rings, and of course–fried cheese curds! Do yourself a favor and pick one up for yourself while you are at it. You will be glad you did!